I really wanted a curry on Friday night but it was a little late so I did not have much time to faff with marinades etc. 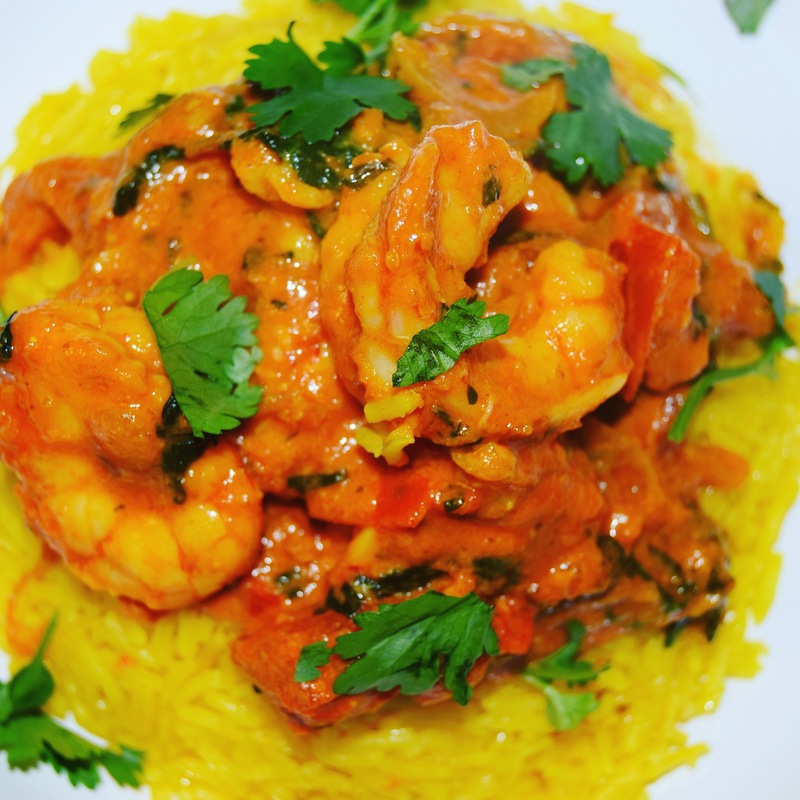 I decided on prawns because they take minutes to cook…. and they are delicious here in Spain ;-). I have named this Tikka Masala as the spices with the yoghurt is similar to that dish. However usually you would marinade the meat in the spiced yoghurt first, but I skipped that part and believe me it did not matter, for a quick curry it was tasty. I also added some spinach to this dish purely because it needed using up! It really added something to the dish and gave a colour contrast to the orange sauce. Tikka Masala is not authentic Indian; in fact England claim to own the heritage of this dish, which is probably one of the most popular take away options. To be honest it is not my favourite but last year my Aunt made a Chicken Tandoori Masala for my blog which I loved so I took inspiration from that dish. If using seeds dry fry, the coriander, cumin, cardamom and fenugreek seeds, then put into a hand blender with about a cup of yoghurt and the puree, blitz to be a paste. Heat a little oil and a knob of butter in a pan and fry the onions until they are soft, remove half and add into the paste and blitz again. Add grated ginger, turmeric, garlic and chopped chilli to the onions in the pan. Add the star anise and cinnamon. Stir. Add the yoghurt paste to the pan and mix well and let it bubble for another few minutes. Add the rest of the yoghurt, the tomatoes, salt and sugar. Add a little water if it is sticking. Taste and check for more seasoning. Add a handful of fresh chopped coriander and the spinach. Add the prawns; let this bubble away until the prawns are cooked. Do not overcook the prawns as they will shrivel up! Once cooked serve with rice and an extra sprinkle of fresh coriander!